There are many changes that could be made to the immigration laws that would enable the United States to gain control over its illegal population. Of all of the proposals, however, E-Verify would be the most effective at curbing illegal entries and limiting nonimmigrant overstays. And the president could likely make it mandatory through executive action. Criminal deportations are essential, of course, and need to be increased. Sanctuary cities, shielding such criminals, have to be reined in. And the routine abuse of asylum, especially using children as a ticket into the United States, has to be quashed. But most illegal aliens are neither drunk-driving, dope-dealing rapists, nor bogus asylum seekers coached by immigration lawyers on how to game the system. They're ordinary working stiffs, half of them arriving legally and then never leaving. They're mainly coming to work, and that's why weakening the magnet of jobs that attracts is essential both to the practice and the rhetoric of immigration control. Since its introduction in 1996 as Basic Pilot, E-Verify remains the easiest way for employers to determine if their workers are eligible to work legally in the United States. A 2016 study confirmed what many have known for years: The E-Verify system is remarkably effective at deterring illegal immigration. E-Verify is a useful, massive data-base, electronic program which gives employers a chance to compare data on people they have just hired with USCIS and Social Security files. If the worker's data does not jibe with the government files, and if he or she cannot subsequently resolve any problems found, then the employer may fire the worker. The point is to keep illegal aliens from being hired. Credibility in immigration policy can be summed up in one sentence: those who should get in, get in; those who should be kept out, are kept out; and those who should not be here will be required to leave. The beauty of E-Verify is that it effectuates Rep. Jordan's vision without the government actually having to deport anyone. If you come to the United States to work (and as an immigration judge, almost everyone I saw came for that purpose), and you cannot get a job, you will leave. So, E-verify is a simple system that is the easiest way for employers to determine if their employees can work legally the United States, thereby turning off the magnet of jobs that draws aliens to enter illegally or overstay their visas. Why isn't it mandatory? Political will. Politicians who want cheap labor don't want it, and politicians who are hoping that those here illegally will be their future voters don't want it. Anyone who follows immigration law (or anyone who has ever applied for job in the United States in the last three decades) knows that, in fact, we currently have an employment-verification system, even if we don't think of it as such. Almost everyone who has ever been hired for a job has been told within three days of employment to bring documents with them to verify their identity and their employment eligibility. Even though it doesn't strictly comport with rules, most employers I am aware of tell their employees to bring their driver's licenses and Social Security cards (or passports) to work, and to fill out the top part of a government document, the Employment Eligibility Verification Form or Form I-9. Do not file Form I-9 with USCIS or U.S. Immigrations and Customs Enforcement (ICE). Employers must have a completed Form I-9 on file for each person on their payroll who is required to complete the form. Form I-9 must be retained and stored by the employer either for three years after the date of hire or for one year after employment is terminated, whichever is later. The form must be available for inspection by authorized U.S. Government officials from the Department of Homeland Security, Department of Labor, or Department of Justice. Not exactly heartening as it relates to their diligence in carrying out the employer sanctions mandates. The administrative inspection process is initiated by the service of a Notice of Inspection (NOI) upon an employer compelling the production of Forms I-9. By law, employers are provided with at least three business days to produce the Forms I-9. Often, ICE will request the employer provide supporting documentation, which may include a copy of the payroll, list of current employees, Articles of Incorporation, and business licenses. ICE agents or auditors then conduct an inspection of the Forms I-9 for compliance. When technical or procedural violations are found, pursuant to INA §274A(b)(6)(B) (8 U.S.C. § 1324a(b)(6)(B)), an employer is given ten business days to make corrections. An employer may receive a monetary fine for all substantive and uncorrected technical violations. Employers determined to have knowingly hired or continued to employ unauthorized workers under INA § 274A(a)(1)(a) or (a)(2) (8 U.S.C. § 1324a(a)(1)(a) or (a)(2)) will be required to cease the unlawful activity, may be fined, and in certain situations may be criminally prosecuted. Additionally, an employer found to have knowingly hired or continued to employ unauthorized workers may be subject to debarment by ICE, meaning that the employer will be prevented from participating in future federal contracts and from receiving other government benefits. Monetary penalties for knowingly hire [sic] and continuing to employ violations range from $375 to $16,000 per violation, with repeat offenders receiving penalties, at the higher end. Penalties for substantive violations, which includes failing to produce a Form I-9, range from $110 to $1,100 per violation. In determining penalty amounts, ICE considers five factors: the size of the business, good faith effort to comply, seriousness of violation, whether the violation involved unauthorized workers, and history of previous violations. In fiscal year 2018, HSI opened 6,848 worksite investigations compared to 1,691 in FY17; initiated 5,981 I-9 audits compared to 1,360; and made 779 criminal and 1,525 administrative worksite-related arrests compared to 139 and 172, respectively; all of these categories surged by 300 to 750 percent over the previous fiscal year. These all seem like pretty big numbers, except in context. DMDatabases states that there are 18,204,679 businesses in the United States. You can do the math. Which brings me back to E-Verify. Section 274A(b) of the Immigration and Nationality Act (INA) describes the employment-verification system that Congress set up in 1986. That section corresponds almost to the letter to the process as described in the USCIS and ICE webpages on "Employment Eligibility Verification" and "Form I-9 Inspection", respectively, above. The E-Verify process begins with a completed Form I-9, Employment Eligibility Verification. Next, employers create a case in E-Verify, using the information from their employee's Form I-9, no later than the third business day after the employee starts work for pay. 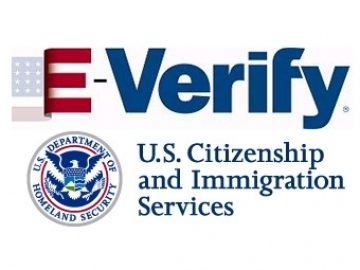 E-Verify checks information entered against records available to the Social Security Administration (SSA) and Department of Homeland Security (DHS). After the employer enters their employee's information into E-Verify, a case result is displayed. The chart below provides an overview of the case results that E-Verify may return. Employment Authorized - The employee's information matched records available to SSA and/or DHS. Verification In Process - This case was referred to DHS for further verification. Tentative Nonconfirmation (TNC) - Information did not match records available to SSA and/or DHS. Additional action is required. Case in Continuance - The employee has visited an SSA field office or contacted DHS, but more time is needed to determine a final case result. Close Case and Resubmit - SSA or DHS requires that you close the case and create a new case for this employee. This result may be issued when the employee's U.S. passport, passport card, or driver's license information is incorrect. Final Nonconfirmation - E-Verify cannot confirm the employee's employment eligibility after the employee visited SSA or contacted DHS. If the initial case result is a Tentative Nonconfirmation (TNC), the employee must be notified and take further action before E-Verify can provide a final case result and complete the verification process. If the initial case result is Verification in Process or Case in Continuance, it means E-Verify needs more time before a final case result can be given. To complete the E-Verify process, the employer must receive a final case result and close the case. Final case results include Employment Authorized, Close Case and Resubmit, and Final Nonconfirmation. E-Verify automatically closes cases resulting in Employment Authorized. What if, magically, E-Verify were to replace all of the steps in the current employment-verification regime and (somewhat limited) inspections? That would logically require congressional action, but there is no political will, as I stated before. Except Congress may have given the president the power to do so on his own. I will explain, including explaining one caveat. Monitoring.-The President shall provide for the monitoring and evaluation of the degree to which the employment verification system established under subsection (b) provides a secure system to determine employment eligibility in the United States and shall examine the suitability of existing Federal and State identification systems for use for this purpose. You would be hard pressed to find anyone who could legitimately claim that the employment-verification system in section 274A(b) of the INA "provides a secure system to determine employment eligibility in the United States." You may disagree with whether such a system should exist at all, but that is not the question. Improvements to establish secure system.-To the extent that the system established under subsection (b) is found not to be a secure system to determine employment eligibility in the United States, the President shall, subject to paragraph (3) and taking into account the results of any demonstration projects conducted under paragraph (4), implement such changes in (including additions to) the requirements of subsection (b) as may be necessary to establish a secure system to determine employment eligibility in the United States. Such changes in the system may be implemented only if the changes conform to the requirements of paragraph (2). (ii) the employee or prospective employee is claiming the identity of another individual. (B) Using of counterfeit-resistant documents.- If the system requires that a document be presented to or examined by an employer, the document must be in a form which is resistant to counterfeiting and tampering. (C) Limited use of system.- Any personal information utilized by the system may not be made available to Government agencies, employers, and other persons except to the extent necessary to verify that an individual is not an unauthorized alien. (D) Privacy of information.- The system must protect the privacy and security of personal information and identifiers utilized in the system. (E) Limited denial of verification.- A verification that an employee or prospective employee is eligible to be employed in the United States may not be withheld or revoked under the system for any reason other than that the employee or prospective employee is an unauthorized alien. (F) Limited use for law enforcement purposes.- The system may not be used for law enforcement purposes, other than for enforcement of this Act or sections 1001, 1028, 1546, and 1621 of title 18, United States Code. (G) Restriction on use of new documents.- If the system requires individuals to present a new card or other document (designed specifically for use for this purpose) at the time of hiring, recruitment, or referral, then such document may not be required to be presented for any purpose other than under this Act (or enforcement of sections 1001, 1028, 1546, and 1621 of title 18, United States Code) nor to be carried on one's person. Breaking this down, E-Verify satisfies section 274A(d)(2)(A) of the INA. Its whole purpose is to determine whether a person with the identity claimed is eligible to work and, if mandated, would establish whether the employee or prospective employee is claiming the identity of another. In fact, it uses and improves upon the current I-9 system. If Andrew Arthur is simultaneously working at seven different jobs (at seven different addresses), the system will know. The documents required would be no different than those currently required under the employment eligibility verification system in section 274A(b) of the INA (remember, it relies on the current Form I-9), so logically section 274A(d)(2)(B) of the INA is satisfied. This is especially true given the improvements in anti-counterfeiting technology following the terrorist attacks of September 11. The availability of the information in the E-Verify system is currently limited so that it is not available to government agencies, employers, and other persons except to verify employment eligibility, and there would be no reason to expand availability to it, so you can check the section 274A(d)(2)(C) box as well. And E-Verify protects the privacy and security of personal information and identifiers that it utilizes, so section 274A(d)(2)(D) of the INA is satisfied as well. E-Verify only verifies whether a prospective employee is or is not an unauthorized alien, so section 274A(d)(2)(E) of the INA is satisfied as well. Moreover, the use of E-Verify is limited to the purposes in section 274A(d)(2)(F) of the INA already. Finally, no new documents are required to switch from the employment-eligibility verification system under section 274A(b) of the INA to E-Verify (remember, again, E-Verify uses the current Form I-9, so section 274A(d)(2)(G) of the INA is not implicated). So far, so good. Not one to be cut out of the loop, however, Congress required the president in section 274A (d)(3) of the INA to give notice before implementing changes in the employment-verification system pursuant to section 274A(d)(1) of the INA. Specifically, the president may not implement any change for at least 60 days, or two years "in the case of a major change" as described in sections 274A(d)(3)(D)(i) or (ii) of the INA. What constitutes a "major change" is the only possible sticking point. Two of those major changes would not be applicable. One deals with a change that would require an individual to present a new card or other document that is designed to be used for the purpose of the new proposed system. No new documents are required under E-Verify than those that may be used for the current employment-verification system. The third would "require any change in any card used for accounting purposes under the Social Security Act." Again, that is not a problem. [A] change which would- provide for a telephone verification system under which an employer, recruiter, or referrer must transmit to a Federal official information concerning the immigration status of prospective employees and the official transmits to the person, and the person must record, a verification code. The online world then took on a more recognizable form in 1990, when computer scientist Tim Berners-Lee invented the World Wide Web. While it's often confused with the Internet itself, the web is actually just the most common means of accessing data online in the form of websites and hyperlinks. So, Congress could no more have envisioned an internet-based verification system than it could have envisioned a website where people share pictures of dogs, cats, and children along with political rants, or one where people sell their old stuff to other people. Fair enough. Except for the fact that the INA has been amended approximately 140 times since the passage of IRCA, and this provision remains unchanged. In fact, section 274A of the INA itself has been amended by the Immigration Act of 1990 (IMMACT 90) and the Illegal Immigration Reform and Immigrant Responsibility Act of 1996 (IIRIRA), among others. If Sens. Ted Kennedy and Al Gore did not think that section 274A(d) of the INA should have been changed to reflect the improvements in internet technology, there's no reason to believe that it should have been. IIRIRA, established three pilot electronic verification programs designed to supplement the paper-based system established under the 1986 law. One of the pilot programs survived, despite significant problems with identity verification as required under IIRIRA and grave concerns about employer liability. That one program, generically dubbed "Basic Pilot" after its statutory section title, was changed to a web-based program in 2004 that began addressing prior issues of verification, nonmatches, system speed, and ease of use. As the Westat report stated, this program is far from static. It is now called E-Verify. In fact, E-Verify was so improved that its use was mandated by DHS for use by federal government contractors. President Bill Clinton had previously issued Executive Order 12989, which rendered contractors or organizational units of contractors that were not in compliance with the INA employment provisions subject to debarment, meaning that they would be ineligible for government contracts, for at least one year, subject to extension if the attorney general so determined, under the employer-sanctions compliance provisions in section 274A(e) of the INA. President George W. Bush later issued Executive Order 13465, which amended Executive Order 12989. As the E-Verify website explains, that executive order directed "all federal departments and agencies to require contractors to utilize an electronic employment eligibility verification system" in order "to verify the employment eligibility of employees performing work under a covered federal contract." DHS thereafter "designated E-Verify as the electronic employment eligibility verification system that all federal contractors must use as required by the amended Executive Order 12989." So, it appears that the path is clear for the president to make E-Verify mandatory. All that it requires is the will, and 60 days' notice before implementation.